Mary Bjelica angles herself to hit the ball at a home match in Macomb. IOWA CITY, Iowa. 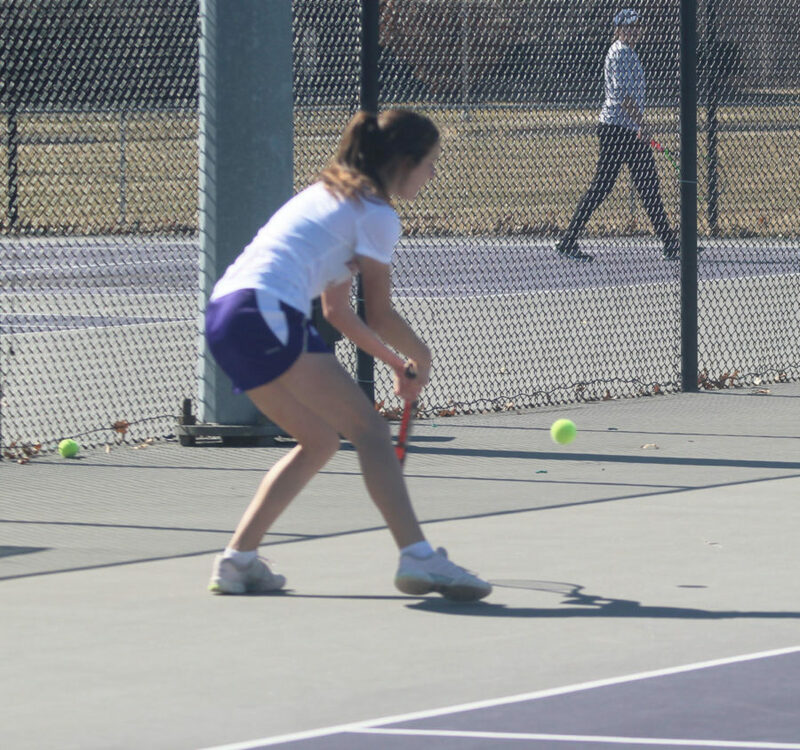 — The Western Illinois University women’s tennis teams took back to the courts over the weekend in the ITA (Intercollegiate Tennis Association) Central Regionals. It was a three-day tournament from Friday through Sunday. This is a winner goes on, loser plays consolation type of tournament, essentially creating an A and B bracket. 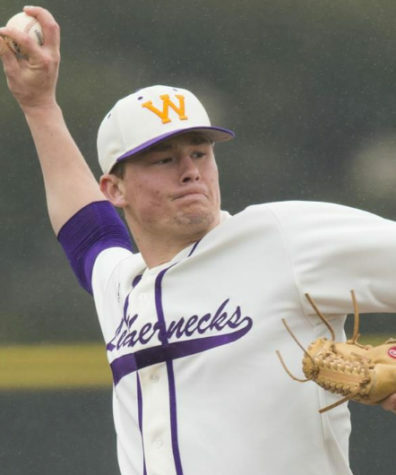 Western did their best to try and win, but there were some top-notch schools making appearances from the surrounding 12 regions. Western obviously being a Division I team, meant they could go up against some tough competition. Schools from every league can play: SEC, ACC, Big 10, Ivy League, you name it, they were there. 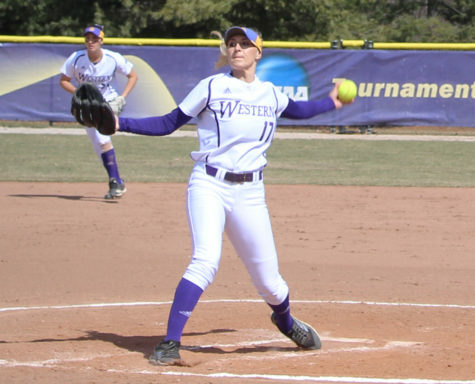 Things immediately weren’t looking too good for the Leathernecks in opening singles play action Friday afternoon. The matches were all delayed due to rain, so everyone had to wait around and try to stay loose. That of course can be difficult to get back into the mood to play well. Whether it was the rain, nervousness or something else, singles match wins were rare over the entire weekend. 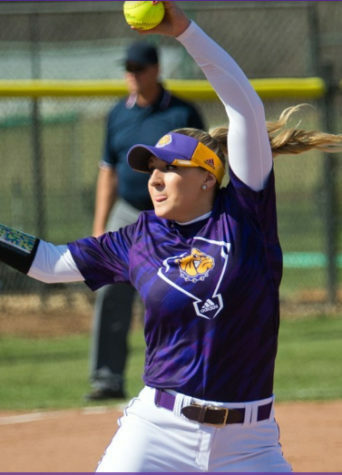 Opening day only saw one win come from sophomore Mary Bjelica. She lost her first match but came back to win her other match two sets to none. Her teammates, as well as her sister, did not have very strong performances. Mary’s sister Ana and fellow returner Laura Ballesteros both dropped their matches in two straight sets. It didn’t go well for the freshman either, as Megan Tagaloa and Camryn Rossa lost their matches in similar fashion, two sets to none. “Except for Mary’s (Bjelica) win at the end of the day, we had a tough day at the office,” head coach Mirko Bjelica said after day one action. Day two, was better than the previous one, seeing better weather, and more wins for the Leathernecks. Mary Bjelica didn’t have the same luck as before, losing both her matches, but her teammates made up for her, once again her sister. Ana Bjeilca defeated her first opponent from Iowa State in two straight sets, but couldn’t hold on in her next match, losing in three sets and ending her tournament run. The last Leatherneck to play was Tagaloa, getting a chance at redemption in the consolations bracket. She dropped her first set 3-6, but she rallied back to win the next two sets 6-4 and 10-8. That wrapped things up for Western, not the best weekend they’ve had in a while, but their coach was still optimistic about it. Western will be in action only once more when they take part in the Missouri State Invitational in Springfield, Mo. It will round out there fall slate, concluding their run of six-straight tournaments on the road. The spring schedule is not yet released but play usually resumes the first week students are back from winter break in January. You can call the fall season a warmup before getting into league play and trying to make that Summit League tournament. They’ll have to wait for that, and until then, they have one more weekend of tennis to play, and the Leathernecks want to end it on a high note.